This historic property, located in Bartlett, includes the oldest log home in Shelby County open to the public, thirty-two acres of plantation land including woods, nature paths and numerous outbuildings. These outbuildings range from a tenant cabin to a commissary to a gristmill to an outhouse. There are also two other log cabins that were moved onto the property in 2006 which came from Libertyland theme park in Memphis. Additionally, the property contains several gardens, including a kitchen garden and a medicinal herb garden. Our current interpretive program primarily consists of docent-led tours of the log home and a self-guided walking tour of the grounds and outbuildings. It is uncertain exactly when or who built the original one room log cabin, which is now the parlor of the manor house. 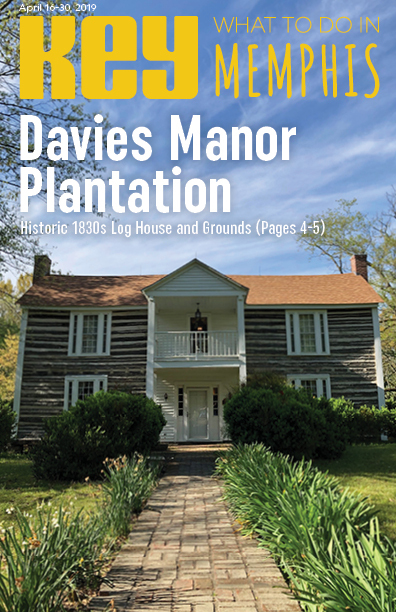 In 1851, the Davies brothers bought the acreage with the log manor house. Adjoining acreage was purchased in the following years and Davies Plantation eventually totaled approximately 2,000 acres. The last tour begins at 3:30 pm. $5 for Adults, $4 for Seniors, $3 for Students. Kids under 6, free. Regular tours through the manor house are docent-led, but we also have a walking tour available for the plantation grounds at no additional cost. For groups of 10 or more, please call the office to make arrangements. In Memphis and Shelby County, MATA is working toward a brighter future! The Memphis Area Transit Authority (MATA) is proud to host the 2016 Tennessee Public Transportation Association (TPTA) Conference and Roadeo taking place October 25-28 at the Memphis Cook Convention Center. Given the increased need for funding for transit programs, public transportation is at an important crossroads. With more than 200 transit professionals traveling from across the state of Tennessee, the TPTA conference is an opportunity to share best practices and lessons learned in order to bridge any knowledge gaps that may exist as work continues to promote the value of public transportation. In Memphis and Shelby County, MATA is working toward a brighter future. For example, MATA is receiving more funding from local, state and federal partners to purchase newer buses, adding $500,000 in bus service improvements to routes that will be implemented in December 2016, and working diligently to bring back the steel-wheeled trolleys that have graced the downtown area. In addition, MATA is working to improve the buses on-time performance to get customers from point A to B in a more efficient way. It's all evidence that MATA is moving forward with a new paradigm of improving service and the ridership experience for all of its customers in order to become one of the best transit authorities in the nation. For additional information about MATA, go to www.matatransit.com. A Photographic Homage to The King of Rock & Roll! When Elvis "left the building" he always seemed to leave something of himself behind for every fan to take home and cherish. It's not surprising that 39 years after his final exit in 1977, The King is still here, for every fan and for millions more. And the end is not in sight. Elvis Presley transcends time. Maybe some of that is due to the length of his career, from brash celebrator of the joys and sorrows of life, love and youth - Heartbreak Hotel, Love Me Tender, Hard Headed Woman, Don't Be Cruel - to the introspections of adulthood, with songs like Suspicious Minds and In the Ghetto. In rich, melodic tones, and with his famous smile, always accessibly warm yet vulnerably self-mocking too, Elvis invited every fan into his world. King for a Day is a book that photographically celebrates the fans who took The King at his word and leapt whole-heartedly into the world of Elvis Presley - the tribute artists and impersonators who travel from around the world to visit Memphis, Tennessee, and pay homage to The King. Coming from all walks of life and of every age, shape, size, ethnicity, and religion, they slide into the famous black leather ensemble, the gold lamé suit, or one of the myriad of individually named jumpsuits, and escape into the everlasting, larger-than-life world that was - and still is - Elvis Presley. Accompanying the photographs are fascinating excerpts of interviews that reveal where these "Elvi" are from, how they first became hooked on Elvis, and what inspires them to go to such great lengths to pay tribute to him. King for a Day reveals the humanity beneath the pompadour, the integrity, commitment and love these performers bring to their passion and craft, offering young and old an opportunity to relive a moment from the past. It brings a younger generation into the music and the legend and the world of a man who, with his songs, his passion and his love of life, changed the world. Erin Feinberg is a New York City based photographer and film-maker with a Bachelor of Science from Northwestern University and a Master of Arts from New York University and the International Center of Photography. In 2014 she published her photobook, Diehards, about passionate music fans from around the world. King for a Day is available through local booksellers and on Amazon.com. Signed copies can be ordered through erinfeinberg.com. The Place for Family Fun! For 50 years, Golf & Games Family Park has delivered good times, enjoyment and loads of fun for the whole family! Golf & Games continues that tradition today, with the same commitment to customer service, and an eye toward a future that continues the same customer-focused service as when the park first opened. Golf & Games not only offers 3 Putt-Putt Golf courses but a host of terrific family features, including: Lighted Golf Driving Range with chipping and putting greens (golf lessons are available), Bumper Boats, Batting Cages, Kiddie Rides, Sky-Trail Ropes Course, Game-room the Maxflight Virtual Roller Coaster and Lasertron, "The Ultimate Laser Action Game." One of the great features of Golf & Games is the Golf Shop of Memphis. The Golf Shop features used clubs and complete tune-up services for your current clubs. Golf & Games Family Park serves a plentiful menu of delicious foods, including chicken sandwiches, cheese nachos, hot wings and funnel cakes. And Golf & Games hosts birthday parties! And church groups, school groups, lock-ins, and approximately 100 corporate and family reunion picnic events throughout the year. Open at 8 a.m. daily and as late as 1 a.m. on weekends during the summer season, Golf and Games Family Park is ready to provide a summer of fun in its 50th year. To join our email club, go to www.golfandgamesmemphis.com. You can also stay in touch with the park on Facebook and Twitter. Where do you find Memphis' finest barbecue? Corky's! Corky's ribs have been voted #1 throughout the South! Lean, tender, hickory-smoked, Memphis-style ribs. Rubbed with Corky's famously flavorful dry shake and served wet or dry, they are the flavor of Memphis, and a must-eat if you're in town. Just as delicious are Corky's wonderful barbecue sandwiches - pork or beef. And both deserve to be enjoyed with a side of Corky's fantastic barbecue beans. Corky's also offers barbecue salad, barbecue chicken, barbecue & spaghetti, hot tamales, chili & Cajun shrimp. And don't forget to get a loaf of onion rings! And just remember, when you're licking your fingers to get every bit of that delicious flavor, you saw it in Key Magazine! Corky's serves lunch & dinner daily. Beer is available. M.C., D.C., Visa, Amex, Discover accepted. There are 4 Corky's BBQ Restaurants in the Memphis area: 5259 Poplar, 901-685-9744, near Poplar and I-240 in Memphis; 1740 Germantown Rd. at Dexter, 901-737-1988, in Cordova; 6434 Goodman Rd., (Olive Branch, MS), 662-896-3663 and 743 W. Poplar, 901-405-4999, in Collierville. Visit corkysmemphis.com for information. Now open in Southaven, MS, Tanger Outlets features 70 outlet stores, owned and operated by the most popular, brand name manufacturers. Buying direct from the manufacturer at Tanger means you'll always save more. Because you're making your purchases directly from the manufacturer (and avoiding the middleman), brand name merchandise can be bought at 30%-70% below retail prices every day at Tanger Outlets. The great majority of merchandise at Tanger Outlets is first quality and in-season: brand name and designer fashions, accessories for the entire family, jewelry, housewares and china, home décor, luggage, toys, books, compact discs, food specialties, and more. Entire stores filled with merchandise from your favorite brands. And because each store is owned by the manufacturer, store employees are very knowledgeable about their store's brand name merchandise. Tanger Outlets Mall is at 5205 Airways Blvd. in Southaven, MS, off I-55 (exit 287) at Church Rd., and is open Mon.-Sat. 9 a.m.-9 p.m., Sun. 10 a.m.-7 p.m. Call 662-349-1701 or visit www.tangeroutlet.com/southaven. For information about other Tanger Outlets, including locations, directions, store listings, shopping hours, phone numbers, etc., go to www.Tangeroutlet.com/southaven or call 800-4-TANGER. Tanger, by the way, rhymes with hanger. American Music Starts Here! Experience the Story at the Memphis Rock 'n' Soul Museum. Meet the Movers & Shakers at the Memphis Music Hall of Fame! The Memphis Music Hall of Fame. Its list of inductees reads like a Who's Who of American Music: Elvis Presley, Otis Redding, Jerry Lee Lewis, B.B. King, Al Green, Justin Timberlake, Isaac Hayes, Sam Phillips, W.C. Handy, Johnny Cash, Booker T & the MGs, The Memphis Jug Band, Charlie Rich, Ann Peebles, Three 6 Mafia, Big Star, Carl Perkins . . . had enough? For more than a century Memphis has been a melting pot of American music - hub of the Mississippi River music corridor, where musicians of all races and backgrounds came together to create a sound that changed the world. The Memphis Music Hall of Fame honors many of the greatest musicians of all time: men and women who shook our planet to the core! Located on Beale Street., the Memphis Music Hall of Fame is Partner-in-Song with the Memphis Rock 'n' Soul Museum, also located on Beale. Developed by the Smithsonian Institution, it's been noted as possibly "the single best exhibition of American musical history in the country." Here, you get the complete story of Memphis music history, presented in an outrageously interactive manner. If you're in Memphis and you're a fan of American music - a club that very likely includes most of the people in the world - these 2 museums are a must-see. They bring it all together. The Memphis Rock 'n' Soul Museum is at 191 Beale St., at the FedExForum and open daily 10 a.m.-7 p.m.: 901-205-2533, www.memphisrocknsoul.org. The Memphis Music Hall of Fame, at Beale & 2nd, is also open daily: 10 a.m.-7 p.m. Sun.-Wed., 10 a.m.-9 p.m. Thurs.-Sat. 901-205-2532, www.memphismusichalloffame.com. For an Easy, Worry-Free, Way to See Downtown Memphis & More! Want to ride the Memphis Trolley? That'll be one dollar, per person, per one-way trip. The cheapest, and one of the most colorful ways to see Downtown Memphis, the Riverfront, South Main Arts District and the medical center. The trolleys run daily (Madison Avenue Line, Mon.-Sat. only), coming to each stop about every 15 minutes. Check the back cover of Key for more detailed schedules, or call 901-274-MATA (6282), or visit matatransit.com. Then, sit back and enjoy the ride! A Quick List Of Key Favorites! Stax Museum of American Soul Music. 926 E. McLemore, 901-942-7685, staxmuseum.com. Booker T., Otis, Rufus & Carla & more. Open Tues.-Sat. Checkerberry Shoppe. 2247 S. Germantown Rd., Germantown, 901-754-3601. Boyds Bears, Cat's Meow - wonderland of treasures. Mon.-Sat. Davies Manor. 9336 Davies Plantation Rd., 901-386-0715, daviesmanorplantation.com. Historic log house. Tues.-Sat. Apr.-mid-Dec.
Memphis Zoo. In Overton Park.901-276-WILD, memphiszoo.org. One of the best in the U.S. Open daily. Autobahn Indoor Speedway. 901-300-3195, autobahnspeed.com. 6399 Shelby View. European style indoor kart racing! Open daily. Woman's Exchange of Memphis. 88 Racine, 901-327-5681, womans-exchange.com. Unique consignment store: gifts, crafts, kids' clothes & great home-cooked luncheons! Mon-Fri.
Mr. Hats! 113 Highland at Poplar, 901-452-2099, mrhats.com. The most complete hat shop in the Mid-South! Mon.-Sat. Rock 'N' Soul Museum. 191 Beale at 3rd., 901-205-2533, memphisrocknsoul.org. How music came out of Memphis. Open daily. Sun Studio. 706 Union, 901-521-0664, sunstudio.com. The birthplace of rock & roll. A national landmark. Open daily. Graceland. 3717 Elvis Presley Blvd, 901-332-3322, graceland.com. Where The King lived. Street name says it all! Open daily. Backbeat Tours offers an upbeat variety of tailor-made Memphis excursions, complete with rockin tour guides who know Memphis as well as their instruments. Hop aboard the Backbeat Bus & let'em sing you some history! Tours depart from the Backbeat ticket window at Blues City Cafe, 2nd & Beale. Call 901-527-9415, 1-800-979-3370, or www.backbeattours.com. A nightlife transportation service connecting two of Memphis' favorite nighttime destinations, Overton Square & Cooper Young, Ride the Roo offers 12 stops, bringing passengers within a short walk of the area's restaurants, pubs, theatres & shops! And what do you find at either end of a Roo-Run? Overton Square,midtown at Madison & Cooper, features a host of restaurants, plenty of boutique shopping, four live-performance theaters & a multi-screen movie theater. The Cooper Young District also offers great shopping & dining as well as art galleries, spas & more. So Ride the Roo & see for yourself! Ride the Roo runs Fri. & Sat. 7 p.m.-2 a.m., from Overton Square to the Cooper Young District. Only $2 per ride. Get more information at ridetheroo.com. You can even track it on the web – www.ridetheroo.com – or follow on Facebook & Twitter: @RideTheRoo! TAKE TO THE TRACK IN EUROPEAN STYLE INDOOR GO-KARTS! Gear up and get ready! Autobahn Indoor Speedway - one of the nation's premiere indoor go-karting facilities - is now opened at 6399 Shelby View Dr. in Memphis. Do you dream of speed? Well, you'll find the ultimate racing experience at Autobahn Indoor Speedway. Autobahn's Formula One inspired go-karts are designed and manufactured in Italy, home to some of the best race cars in the world. They're the fastest in the industry. Adult karts can reach speeds up to 50 mph. Junior karts top out around 25 mph. Because electric go-kart technology is continuously revolutionized, they're durable, reliable, easy to handle, modern and fast. "We are honored by the excitement and enthusiasm we have seen so far from the Memphis community," said Anthony Dillard, General Manager of Autobahn Indoor Speedway. "We pride ourselves on being able to offer racing fans a cool, modern facility with a unique and real racing experience." Autobahn Indoor Speedway Memphis boasts a 40,000 square foot state-of-the-art facility. Inside, racers test their racing abilities on a Grand Prix style track full of straight-aways and tight turns. Corporate racing packages are available for small to large corporations looking to enhance corporate culture. Autobahn, the perfect entertainment destination for any occasion, is open to the general public 7 days a week for "Arrive and Drive" racing. It's also great for birthday parties, corporate events, reunions . . . hey, if you're looking for a fast-paced thrill-a-second, one-of-a-kind experience, Autobahn Indoor Speedway is perfect anytime! Autobahn Indoor Speedway is open 11 a.m.-10 p.m. Mon.-Thurs., 11 a.m.-midnight Fri., 10 a.m.-midnight Sat., 10 a.m.-8 p.m. Sun. Autobahn Indoor Speedway is at 6399 Shelby View Dr. in Memphis, between Sycamore View and Raleigh Lagrange, just north of I-40. For information call 901-300-3195, visit AutobahnSpeed.com, or Facebook.com/AutobahnMemphis. Enjoy All The Things Memphis Has To Offer! Two locations: 688 S. Mendenhall, Memphis 38117, 901-682-3966; & 7825 Winchester, Memphis 38125, 901-737-6755. Offering the freshest quality seafood in the Mid-South, as well as hand-carved steaks, sandwiches & salads. Open daily for lunch & dinner. Week-end brunch, Sat. & Sun. til 3 p.m.
1010 Casino Center Dr., Tunica Resorts, MS 38664; 662-357-1111 (room reservations 1-888-245-7829). 939 Ridge Lake Blvd., Memphis 38120, at Poplar & I-240; 901-684-6664. Atmospheric bistro features a menu of classic American cuisine. Daily breakfast buffet offers made-to-order omelettes & waffles. Rooks Corner also offers an affordable lunch buffet Mon.-Fri., & nightly dinner specials. Open daily, 6:30 a.m.-10 p.m. Major credit cards accepted. A nightlife transportation service offers 12 stops, bringing passengers within a short walk of the area's restaurants, pubs, theatres & shops. Shuttle runs Thurs. 5 p.m.-midnight; Fri. & Sat. 5 p.m.-2 a.m., from Overton Square to the Cooper Young District. Only $2 per ride. Newly renovated downtown hotel, at 250 N. Main St., Memphis 38103 (901-527-7300), the Downtown Sheraton is next to the Memphis Cook Convention Center & offers superior city views from 600 guest rooms. Located at a Main Street Trolley stop, it's convenient to the FedEx Forum, National Civil Rights Museum, the South Main Historic Arts District & just a short walk from the Mississippi River & Beale Street. Crossroads Tavern & Grille offers full dining service daily, featuring handcrafted cocktails & artisanal wines. Across from Audubon Park, at 4339 Park (901-761-5250), the Dixon features one of South's finest collections of French Impressionist art, antique furniture, & 17 acres of formal & informal gardens. Open Tues.-Fri. 10 a.m.-4 p.m., Sat. 10 a.m.-5 p.m., Sun. 1-5 p.m., closed Mon. Admission $7 adults, $5 seniors 65 & over, $5 students with ID, $3 children 7-17. See page 6 for more on Dixon's current exhibition. For more than 150 years Premier Transportation Services has been transporting Memphis area residents safely and securely to their destinations, 24 hours a day, 7 days a week, 365 days a year. Yellow and Checker Cabs, manned by experienced, professionally trained and permitted drivers, are clean and well-maintained; drivers are experienced and professional, helpful and polite. Twenty-four hour, on-demand Courier and Package Delivery Services are also available. MasterCard, Visa and American Express are accepted. Call 901-577-777 or order on-line at www.yellowcabofmemphis.com. Premier also offers airport shuttle services (call 901-577-7700 or 1-800-796-7750); group and meeting transportation; and VIP Executive Sedan Services -- no airport lines; no hassle. Chauffeured sedans are also a worry-free way to enjoy a night on the town -- no parking hassles; no designated driver. A minimum 24 hour notice for all service is requested. Office hours are 8 a.m-6 p.m. Mon.-Fri.